Pav bhaji is a very popular street food of India. In marathi pav means bread and bhaji means a potato based curry. Pav bhaji was a quick but light meal eaten by most mill workers in Mumbai. 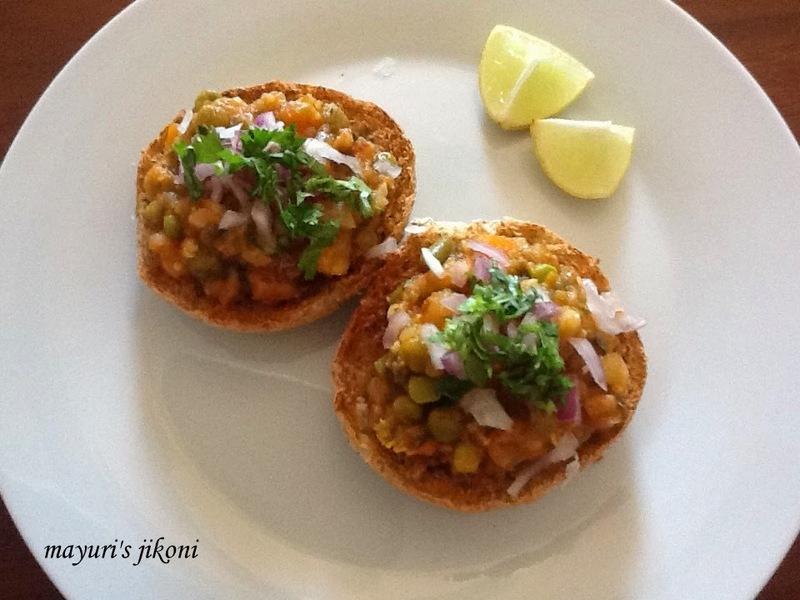 Most people visiting India do not leave the shores without having tasted pav bhaji. The street version, is usually full of potatoes, dried peas, tomatoes and onions, served with a generous helping of butter, raw onions, fresh coriander and a wedge of lemon. The bread is overly buttered, but that’s what makes it so tasty. My first taste of this dish was when I was studying in Mt. Abu. On a very cold evening, the smell of butter and fried onions was very inviting. I learnt how to make pav bhaji at home from Nunu, my mother-in law. She uses a variety of vegetables, a very innovative way of getting my young ones but now adults, to eat vegetables they would usually frown upon. You can vary the types of vegetables you would like to use to make pav bhaji. Cut the tomatoes into chunks and put in a pan. Cover it and let them cook over low heat. When done, puree it. In another pan, put the water to boil. When it starts to boil add the vegetables (peas, french beans, cauliflower, brinjal, carrots) and 1 tsp salt and let them cook till done. Drain into a colander, save the water. At this stage you can completely or partially mash the vegetables. In another pan, heat the oil. Add the cumin seeds. When they splutter, add the onions and saute till they turn light pink. Add the garlic and ginger paste. Saute for a minute or so and add the chopped coriander and red chilli powder. Add the tomato puree half tsp salt and sugar. Cover and cook till the tomatoes become bright red. Add the mashed potatoes and vegetables. If the mixture is dry then add the saved water.Mix well and cook the bhaji over medium heat for nearly 15 minutes or so. Don’t leave the bhaji too watery. Take it off the heat. Add the ready made pav bhaji masala and lemon juice and mix well. Taste and add salt, masala and chilli according to your requirement. In the photo the bhaji appears pale in colour as my family does not eat really chilli food. Garnish with the coriander, onion and dollops of butter. Put the lemon wedges on the side. Toast the buns either under the grill or on a tawa or a frying pan. If you want to prepare it for a dinner party, cook it the previous day and store in the fridge. It gives the masalas time to work and the bhaji tastes so much better. I prefer to use the Everest pav bhaji masala, but you can use whatever is available. When I am not making pav bhaji for guests, I avoid the dollops of butter to make it a healthy meal. For a richer taste, saute the onions in butter instead of oil. If you use canned tomatoes, then you may need to add a bit more sugar as they are usually more tangy. Your daughter succeeded in making a delicious pau bhaji dinner, close to yours!